White & Red Affair ! 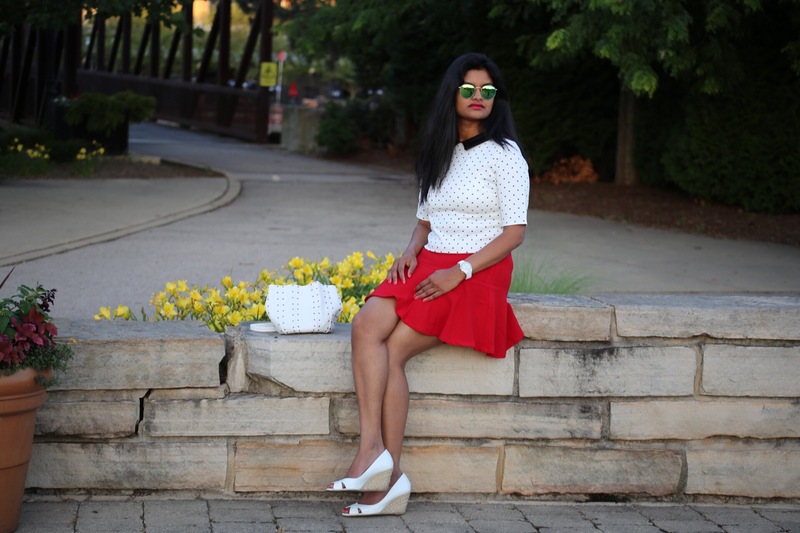 I am back with another cute post on #WIW (What I Wore) styles for this summer! In my last blog , as you all know I talked about a pleated Skater skirt , here I back with another style of skirt , Fluted mini skirt ! This style of skirt is yet another cute trendy fashion for this summer featuring a fluted silhouette . There are some times while I am shopping , as soon as I see something , I immediately fall in love 😍😍 with it and I knew I am gonna get it ! And this skirt is one of those , for its pretty color , texture and specially the style of the skirt. It is not a high waisted neither low waisted , it sits just above the belly. I shopped this cute one from Forever 21 (similar). And I paired it with a Polka crop top (from Zara ) , which is perfect combo ! I just love to wear anything with Polka prints. You give me any clothing with Polka prints , I am ready to Don it. I absolutely love Polka collection, cant get enough of those in my closet. Here is my cute Bucket Bag from Zara . Bucket bags have been fashion since a while , but I never found a perfect one , but this one stole my heart. I feel white attracts me a lot , never realized though! This bag perfectly matched my outfit and my top. love this look. the polka dots shirt looks perfect.